The Lavender Cottage is an enchanting 2 bedroom 1 bath classic Bend cottage built in the 1920's during Bend's mill town heyday. Bright, sunny, and well cared for, this home is completely updated with all the modern amenities. The fabulous location on Bend's popular Westside, just 4 blocks from Drake Park, makes this home the perfect choice for a relaxing and authentic Bend vacation experience. On a breezy summer day you may enjoy the home's charming private gardens filled with lavender, culinary herbs, and native plants. Have dinner on the deck with friends, cooking out on the huge gas grill, or relax in the hot tub under a desert sky filled with stars. Experience the true down-to-earth Bend lifestyle by taking the provided cruiser bikes for a spin around town. You are a 5 minute bike ride to the heart of downtown, crossing a charming wooden bridge across the Deschutes River, and meandering through Drake Park. Enjoy a short stroll to great restaurants, pubs, shops and coffee, all just a few blocks away! If you prefer to get out of town and into nature, there are plenty of hiking and mountain bike trails just minutes from town. Mount Bachelor Ski Resort and the spectacular Cascade Mountains with many lakes are an easy 20 - 25 minute drive providing endless opportunities for your outdoor adventures. This home proudly features European style bedding with fresh, clean duvet covers and high thread count linens, new, comfy beds, a fully equipped kitchen with dishwasher and microwave, washer dryer, dvd, cable, wireless internet, games, and much more for you to discover! Once again Bluebird Day Vacation Rentals has made our stay a great one. With Rebeccas recommendation, we stayed in Lavender cottage and found it to be quiet and comfortable, including the beds. The location is perfect for us, and makes it easy to walk to grocery store, The Lot food trucks, and bike shop nearby. I would stay here again, and will definitely use Bluebird again because they are so friendly and helpful! Lavender Cottage was a very good choice for us as a base while we looked at real estate in Bend. First, the cottage was quite well equipped with the things we wanted to just have a comfortable home base experience - the beds were comfortable, the morning sun came in from the front and the evening sun said goodbye from the back of the property - the kitchen was spacious - the bikes and hot tub were special plusses. Second, we could walk anywhere easily - trips to Newport Market - trips to Galveston and the micro breweries and bagel places there - crispy early morning walks up and down hills. Third, it was cold in the mornings and the Cottage heating system was very responsive. We would do it again. Lavender Cottage is great! Clean+ fresh, its well-organized and thoughtfully stocked with items you may have forgotten (shampoo) or might not want to buy (salt). The beds are comfy with warm comforters. The location is super, near lots of restaurants, a grocery store and playgrounds. Bluebird rentals provided excellent communication and we would definitely return. Cannot imagine who would not enjoy their time at Lavender Cottage. Great stay!! We really enjoyed our stay at the Lavender Cottage. The house was clean and exactly as described. It had everything we needed for a week away with my family. The beds were very comfortable! It was also in a great location...walkable to most everything from town. The host was helpful, friendly and provided timely communication. They even sent someone over at 8:00 at night to fix an issue with the hot tub. We would definitely rent this house again! Thanks for making our stay in Bend a wonderful experience! The lavender cottage was perfect! Great location, easy to find, walking to great food and cute shops. This was our first time in bend and the lavender cottage was the best place to stay. We really enjoyed our stay at Lavender Cottage! I am a clean freak and it passed my standards. It was nice to have as fully equipped a kitchen as one can expect from a VRBO. The location is ideal - 10 minute walk to the park and downtown is just beyond that. A big plus were the "permanent" food trucks just a block away. The neighborhood is quiet and felt very safe. We would definitely recommend Lavender Cottage! Bluebird Rental made everything so easy. Sweet little cottage in a fantastic location. We had a wonderful time and would happily return for another visit. This house was totally perfect - so incredibly close to downtown, and such a comfortable cozy spot. The grassy back yard was a great spot to hang out with our kids (when they werent going nuts at nearby Columbia or Compass Parks), and they loved the fresh strawberries growing in the planters. The beds were really cozy (havent slept so well in ages), and the house was very well-apportioned. Only thing I couldnt find was a coffee grinder. The neighborhood is totally cute and had tons of amenities - including delicious Foxtail Bakery, 10 Barrel Brewery, and 1 Eyed Sisters coffee. Newport Market is so close for anything you could think of wanting. 3 days wasnt really long enough to explore all of Bend, so well have to come back again soon! I didnt think Id arrive to see the little cottage just as it appeared in the pictures. Even the poppies were in bloom! We are a family of 5 and the cottage worked perfectly for our two night stay in Bend. There is far too much to see in Bend, and wed love to come back. When we do well stay here again. The house is so comfortable and warmly decorated; the hot tub was a very nice perk; the kitchen is fully stocked; beds were comfy--everyone enjoyed our stay. It was especially nice to be able to walk to some delicious food finds--The Victorian Cafe, 10 Barrel Brewing, The Lot with all the food trucks....everything was walkable. If you are planning to explore Bend, this is a great place to stay! @LocalFreshies travels to Bend every Spring season for awesome beer, sun, snow and people! Bluebird rentals is one of the best mgmt companies EVER and all their properties are amazing and never disappoint. The Westside of Bend is great and the Lavender Cottage is walking distance to everything. It is adorable, comfortable, relaxing and absolutely perfect!!!! The secret is out - this historic little bungalow is amazing and can easily accommodate a family, two couples or a romantic little getaway. This was an adorable home within walking distance of everything you could ever want in Bend. The front and back yards provided peaceful morning coffee times and great evening BBQ settings. Our group stayed in the Lavender Cottage last week during a ski weekend. After a long day on the slopes, the hot tub was perfect for our sore muscles, and the beds were extremely comfortable. One of us even slept comfortably on the couch. The proximity to great restaurants made it convenient when we were too tired to cook, although the kitchen was well stocked and perfect for our breakfast creations. The owners left thorough instruction for us and checked in with us upon arrival to make sure we had everything we needed. I will definitely come back and recommend to friends. Hosts are always great! Love their properties! Always clean and comfortable! Love the hot tub! I really enjoyed my stay. Very cute bungalow in town! what a find many years ago and we keep returning to this perfect hideaway. Close to downtown, pubs, all kinds of restaurants, all within walking distance. And a well appointed kitchen if you want to stay in one night and cook or barbecue. And best of all, after a day of hiking, golf, rafting, shopping, etc, a wonderful hot tub! My family and I had the pleasure of staying at the lavender house recently. The house is lovely and comfortable. The outdoor space is beautiful and the location is very convenient. Sarah and Paige are very helpful and responsive. We would absolutely stay here again. We love Bend and Oregon and hope to be back again soon! This cottage is beautiful with everything you need to feel at home. The beds and linens were comfortable and both the front porch and the backyard were lovely places to relax. We were there with our two boys for three nights and wish we had stayed a couple weeks. The cottage is in a quiet neighborhood within walking distance to the river, downtown and several playgrounds. We would definitely stay here again! My girlfriend, sister, and I stayed at the cottage last week for four nights and had a fantastic time. The cottage was super close to downtown. We really liked how the cottage came with a few bikes for us to ride around. We rode bikes everywhere...definitely a lifestyle we could get used to. The neighbors on both sides of us were super friendly and helpful with local recommendations. The house was clean, cute, and totally hassle free. Hope to come back soon. Thanks Audra and Paige. 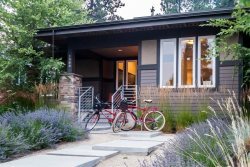 Such an amazing foxy place to stay and the location couldnt be any better, especially with the available cruiser bikes you can take into old town (the best part of Bend). Three of us came over from Boise for an all ladies mountain bike camp but didnt want to stay in a hotel. The house has such charm, from the front and back porches to the landscaping on the outside. Inside, exceptionally clean and had all that we needed and more. The laundry room was great for keeping our bikes safe and the washer and dryer for our daily bike clothing. Beds were very comfortable and linens were more then enough all around. Hot tub was an added bonus and a necessity after long days on the bike. We only wish we could have stayed longer to enjoy a bbq in the back yard and ride back into town on the cruiser bikes! This was our second stay in the Lavender Cottage. The house is clean and well stocked. We love the area because it is in walking distance to so many places - restaurants, town, park, coffee shops and bakeries.